EUROPEAN GOVERNMENTS GET their own say on Brexit this week as they debate future ties with London in the run-up to Sunday’s summit to sign papers for the agreement. Brussels, meanwhile, insists Britain cannot have the same privileged access to the single market as it did as a member state after Brexit on 29 March next year. This morning RTÉ reports EU Ombudsman Emily O’Reilly has called on the European Commission to publish a document it has that sets out all of the areas of North-South cooperation under the Good Friday Agreement that are at risk. The European Commission and the British government had refused to publish it because they said negotiations around the Irish backstop were so sensitive. However a case was taken to the Ombudsman’s office on public interest ground and O’Reilly said there is “no obvious reason” it can not be published. European negotiators plan to publish their version of the statement on future relations tomorrow, after their ambassadors met over the weekend. According to diplomatic sources yesterday, the document was fleshed out from just over six pages to around 20 as more details were agreed. Meanwhile closer to home for May, a group of cabinet ministers is to meet about the possibility of renegotiating some parts of the draft deal the Prime Minister presented last week. 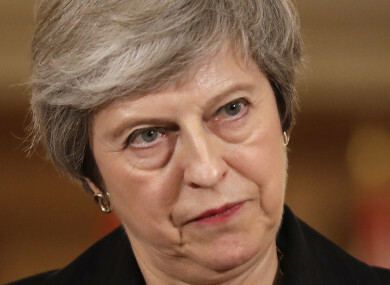 May will speak to business leaders today where she will tell them that this withdrawal agreement will stop EU migrants “jumping the queue”, BBC reports. “Instead of a system based on where a person is from, we will have one that is built around the talents and skills a person has to offer,” she is expected to say at the CBI business lobby group annual conference in London. She will also tell the conference that she is not willing to reopen discussions with Brussels over the withdrawal agreement. - © AFP 2018 with reporting by Michelle Hennessy. Email “'Intense' week of talks for May as EU negotiators set out plan for relationship with Britain”. Feedback on “'Intense' week of talks for May as EU negotiators set out plan for relationship with Britain”.